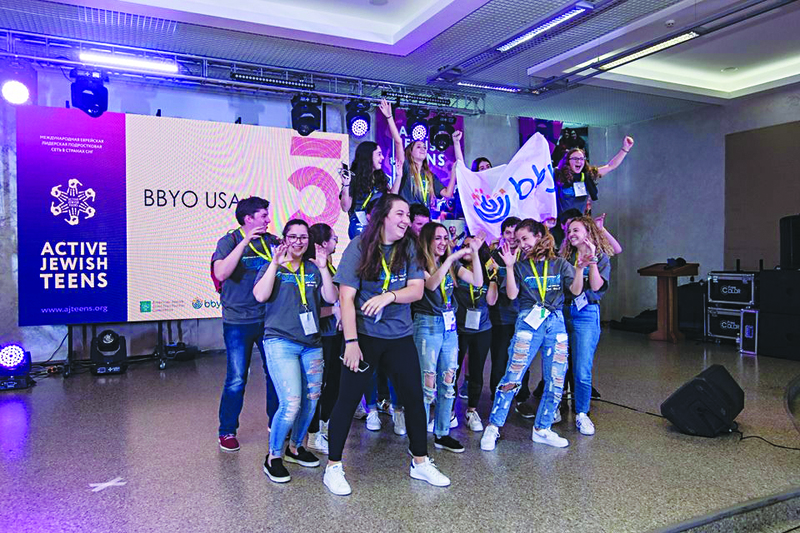 Hannah Fritts and 19 other teens represented the United States as BBYO ambassadors in Kiev last month. On Nov. 4, 2018, I joined 19 other Jewish teens from across the United States for an eight-day journey to Kiev, Ukraine. The 20 of us were going as international ambassadors with BBYO, a Jewish teen-led youth organization, to explore the city, learn and bond together, tour historical sites, do service projects, and be part of the international delegation to BBYO’s partner organization in the former Soviet Union, Active Jewish Teens, fifth International Conference. Our time in the city and engaging with the local Jewish community was absolutely incredible, but the conference is definitely what stuck with me the most from the trip. At the conference, I was placed in a programming group filled with incredible people. There, I was able to make powerful connections with everyone in my group, despite not speaking the same language as all of them. With all the programming being in Russian, my translators were an integral part of my experience. The girls who would translate for me became my friends quickly. Our off-topic conversations turned into strong friendships, and we would spend our breaks chatting, bonding over our cultural differences, dancing the night away during the final party and crying into each other’s arms the next morning when we had to say goodbye. I was crying not just because we had to go our separate ways, but because the stories of the teens at the convention, like these girls, were moving and inspiring. Jewish life has always been an under-appreciated freedom of mine. I grew up at Temple Shalom and became a bat mitzvah, but in recent months I began to ponder my Jewish identity more than ever before. On the bus ride after leaving the convention, I began to analyze all the little things that led me to Kiev — the things that led me to meet these people, hear their stories, and be given the privilege to have them be a part of my lifelong Jewish journey. All my Jewish ancestors came to America from Eastern Europe. They dreamed of an American Jewry so strong that it was able to be a light for other Jews around the world. This is the beautiful Jewry that BBYO enables, not just for teens in America, but for teens in places worldwide where Judaism is finally being rekindled. That is what brought me to tears — the thought of these teens activating their Judaism and being the first generation in a long time to live a Jewish life, celebrating it, and sharing it with me. I went on this trip wishing to have a stellar travel and learning experience, but I walked away with much more than just that. I left with many little blessings to carry with me in my mind for many years to come. Blessings of newfound friends, religious perspective and memories that will last longer than my lifetime, because I get to share them with all of you. Memories of laughter despite not sharing a language, smiles despite not sharing any acquaintance and lasting friendships despite not sharing geography. This trip has excited and inspired me to take on new adventures, make the most out of the rest of my time in BBYO and not take my Judaism for granted. BBYO has given me the outlet to explore, refine and elevate my own Jewish identity, and through this trip, I have been given the privilege to honor our history, serve the community and be a small part of someone else’s Jewish life. Hannah Fritts is a junior at The Winston School of Dallas and is engaged within the Jewish community. She holds leadership roles both within BBYO and her school’s student government. She also loves singing and spending time with friends.